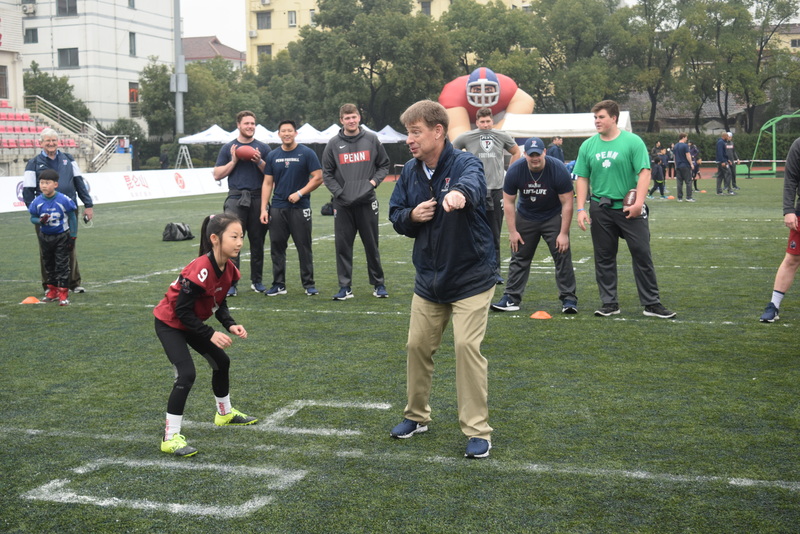 While making history by becoming the first Ivy League school to play a game of football on the gridiron in China, the University of Pennsylvania Quakers eased past the American Football League of China (AFLC) All-Stars 85-0 to win the Penn-China Global Ambassadors Bowl in Shanghai. The final score of the game that capped a week of sporting diplomacy, making friends, coaching youngsters eager to discover the sport and spectacular sightseeing was not important. 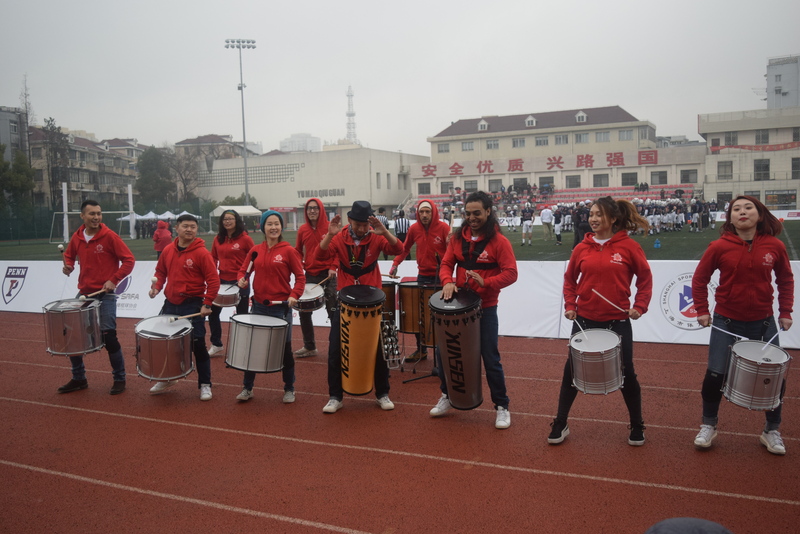 The winner at Lokomotiv Stadium in downtown Shanghai was the sport of American football. 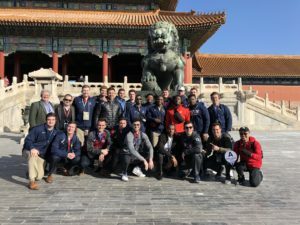 Just two weeks into spring practices with three new coaches on staff, the Quakers played every healthy player more than 20 snaps and allowed each to take in the grandeur of their international experience. For two hours before the game, Penn’s coaches and players held clinics for more than 125 young Chinese athletes, ages 13 & under, aspiring to become American football players. Included in the group was a local team coached by Penn alum Justin Chun, who resides in Shanghai. 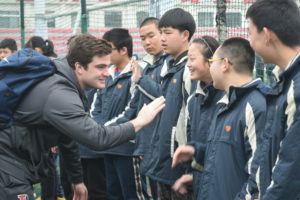 One of the clinics in the morning was held for children participating in Special Olympics, arranged by the US Consulate Beijing, presenting a chance for Penn players to spend quality time with these outstanding young men and women while encouraging their continued pursuit of sport. The most fascinating part of the clinics was the lack of language barrier. It didn’t matter if you were American or Chinese, young or old. Everyone spoke the language of football and the most commonly spoken phrases came with a smile as Coach Priore stood at midfield to oversee seven stations of action as the campers learned basic football skills from every Penn student athlete. 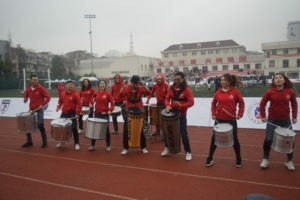 There were multiple musical and cheerleading performances before and during the game which was produced in partnership with the Shanghai Rugby Football Association. Enjoying the afternoon were representatives from the Chinese and U.S. governments who joined Penn Director of Athletics Dr. Grace Calhoun and staff from NFL China to officially open the game. 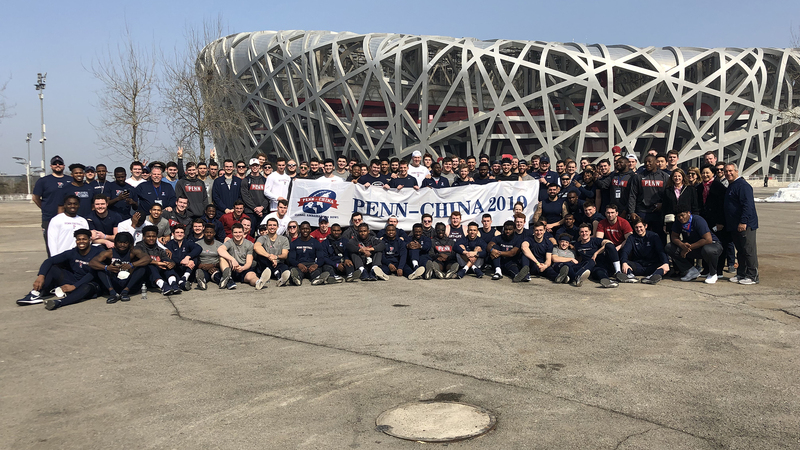 As Penn took the field, the PA announcer read his script like he was introducing a championship boxer, rattling off the Quakers’ seven national championship and 18 Ivy League titles as the crowd cheered and smoke rose to welcome the team to China. Penn’s captains took the field and included Travis Wang, for whom the week had been special as the Hong Kong native was a focal point back in his home region. At kickoff, the Quakers took the ball and put on a show. The second play of the game was a 60-yard touchdown pass from Mason Quandt to Darnell Fleury and on the China All Stars’ first possession a Jacob Martin interception led to a touchdown pass from Ryan Glover to Rory Starkey. By the time halftime rolled around, the score was 57-0, though the hosts enjoyed some big plays, including a strip of a Penn receiver and fumble recovery, which led to a big cheer from the home fans, as did a sack of Penn’s quarterback late in the first quarter and a fourth-down conversion in the air early in the second quarter. There was more of the same in the second half. 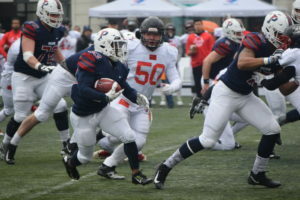 The Quakers scored a few more rushing touchdowns and added a 100-yard interception return after the AFLC All-Stars had marched to the doorstep just two yards from the end zone. The hundreds of young boys and girls among the sell-out crowd of 3,200 cheered every play, often supporting both teams. There were many American ex-pats in the crowd with their families, getting a small slice of home 7,000 miles away. One of the Penn seniors said they took 40 minutes’ worth of photos with fans, everyone wanting to meet American football stars. Another highlight of the trip was the postgame scene as hearty handshakes and hugs were exchanged at midfield, jerseys were exchanged, and cell phones took a multitude of photos. 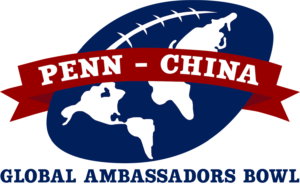 Winning was not the point of the Penn-China Global Ambassadors Bowl. Growth was the point. Growth of the game of football as well as growth of the young men who make up the Penn Quakers. They travelled halfway around the world to a country few understood to play a game against a team they’d never seen. Penn defensive back Austin Cooper has taken Mandarin for six years, excited to use it in his business career upon graduation, so was a great help in terms of translation. While in China, the Quakers visited The Great Wall, Tiananmen Square, The Forbidden City, Old Beijing, 2008 Olympic Venues, the Huangpu River, Yu Yuan Garden, Shanghai World Financial Center, Chinese Acrobatics, Kung Fu Show and the Temple of Heaven. They also were impressively hosted by Penn and Wharton Alumni at various special meals and events, helping to forge a powerful union between Penn Football and these notable Penn supporters.